What is the Product Marketing Bootcamp? And it's not just learning, it's doing. In addition to understanding the concepts, you'll get how-to guides and templates that you can use in your job today. The only online course covering the essentials of end-to-end product marketing. Access anytime, complete at your own pace. Get it done. How-to guides and real world examples and templates you can use today. Marketers trained have succeeded at companies like Microsoft, Google, LinkedIn, Lyft, Eventbrite, Figure Eight and more. Great product marketing drives business growth by defining growth strategies and marketing plans that win customers. But there are no practical guides on how to actually do product marketing. There is no training on positioning, launch planning, or how the end-to-end process works. There are no guides to show you how to actually get stuff done. I remember this when I was a new product marketing manager. I learned by practicing on the job and working it out through trial and error. Over time, I developed a process. And as I started building and leading marketing teams, I taught them. People who came to me with backgrounds in design, sales, and customer care became marketers. I enjoyed developing leaders so much that I started teaching, and now I'm bringing this class online to help more future marketing leaders. So if you want to stop feeling like you’re winging it, and if you want to acquire practical skills and how-to guides so you can become a strategic product marketer and drive business growth, this class is for you. No, this is an online class with prerecorded video lectures. You'll also get, handouts, exercises, and templates for you to practice and use on the job right away. Does this cover all aspects of product marketing? 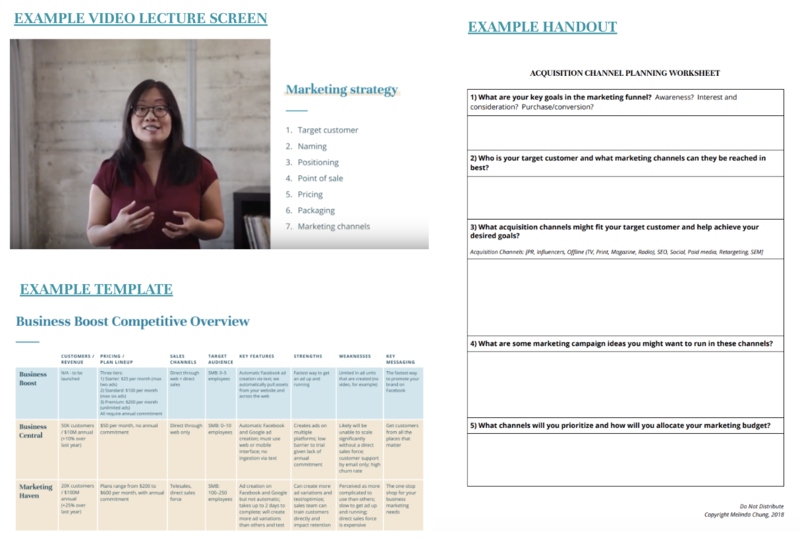 This class focuses on the essentials of product marketing: market and user research, competitive analysis, positioning, launch planning, acquisition and engagement marketing, and customer analysis and metrics. Please review the syllabus for more detail. There are other areas that will be covered in future classes. How long do I have to finish this class? You have lifetime access to this class and can finish it at your own pace. This class focuses on the essentials of product marketing. This class is not for you if: you already have significant experience in product marketing and a structured framework for doing so or if you are looking for a deep training on digital marketing. There are about two hours of video lectures and handouts, templates, and quizzes along the way. So you'll likely spend 4-5 hours working through this course. Is this class focused on B2B or B2C? This class covers frameworks that can be applied for both B2B and B2C companies. Marketing funnels and launch marketing plans also include examples for both business and consumer-focused products. However, we discuss tactics for lead generation but do not focus on other sales enablement activities as part of outbound channels. Melinda Chung has over 15 years of experience leading strategy, marketing and product management in technology companies. Melinda has built marketing teams from the ground up at two companies and has led full-stack product marketing teams at companies including Yahoo!, StumbleUpon, Locu (acquired by GoDaddy), and GoDaddy. Melinda is currently Director of Product Marketing at Adobe. Melinda has an MBA in Marketing & Strategy from the Kellogg School of Management at Northwestern University and a BA in Mathematical Economics from Pomona College. Ready to learn practical skills to succeed in product marketing?